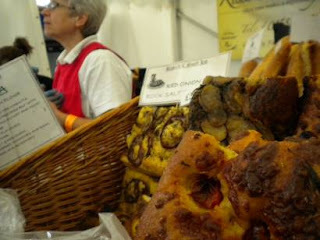 Good friends of ours took us to one of their favorite local events this past weekend: the Ludlow Food Festival. 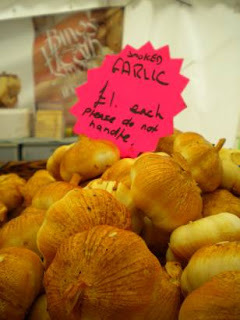 In it's 17th year, the festival takes place inside as well as outside Ludlow Castle grounds, and showcases a huge variety of foods all produced locally. Foodie or local food enthusiast or farmer this festival is testimony to how much great food can come from one region. I was stunned, stuffed, and thrilled to have been able to attend. When we next come to the festival, it will be for all three days. And with a planned exercise regime. I believe I gained three pounds in cheese samples alone. It is also testimony (any one in Detroit reading?) what an economic engine food can be. While these folks won't get super rich, they can support themselves doing something they love. As a community development geek with vegetables at heart, it was inspiring to see how one town built on an agricultural and food heritage (and a very nice castle ruin) to become a buzzing hub of yumminess in all price ranges that people come from far and wide to savor. I'm not from Ludlow nor am I English, but I was very proud of what I saw there. The pleasure of such festivals, of course, is not just the food. It is the opportunity to meet and talk with the people who grow, produce, make, and concoct the fine foods on the table before us. I learned how cider is made (not just any apple will do, apparently), that there is a wild boar farm not far from here (lock your doors, please), and that damson plums make a fine ketchup. I was stunned at the level of enthusiasm the vendors maintained to the last moment of what must have been an intense three days of customer interaction. Cider. 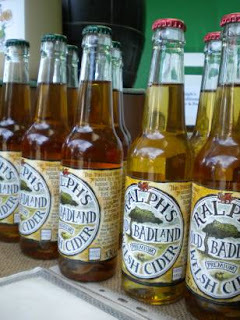 From Ralph's to Oliver's to Rosie's, there was more cider than it was possible to sip in a single day, although my husband certainly gave it a good try. Who knew there was such a thing as a cider apple containing the yeast and sugar already? Who knew that cider stored in old rum barrels could be so lovely? Or that 300 kilograms of apples would make 45 gallons of this appley delight? Cheese. Welsh, farmhouse, cheddar, damson, and more passed my lips and filled my bag by the end of the day. An amazing array of flavors and textures that I can't even begin to describe were on display and getting scarfed up by attendees standing three and four deep. I'm heading back to the Ludlow Food Centre, though, for their cheddar. 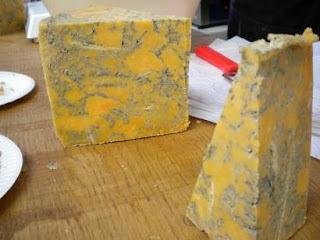 A pretty yellow cheese rippled with blue the flavor is both strong and subtle, and good enough to draw me back over Clee Hill to make a purchase. Preserves. 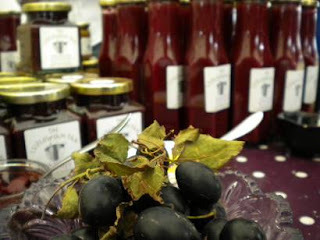 Damson, greengauge, rhubarb marmalade, picalilly, mustard, and chutneys galore were out in their finest to tempt and seduce. While I fell rather hard for Ludlow Jam Pan's damson ketchup, I opted for their damson jam. (Damson's are, literally and figuratively, a sweet little plum I fell for three years ago, and I've not looked back since.) Sadly, I was too full by the end of our day to even think of buying a jar of What A Pickle's Tomato Chilli Jam, but I did love the sample. Sausage, salami, and pie. Wild boar, venison, pork, pork and leek, and more were just a few of the savory sausage samples sending our taste buds soaring. 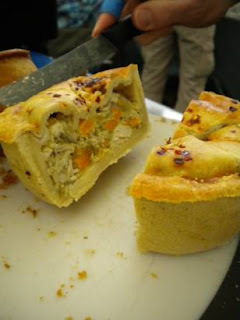 Pie Mania's uniquely flavored Thai Chook Pie (free range chicken, fragrant Thai green curry, sweet potato and lime) had us all swooning as did Legges of Bromyard wild boar and pork sausages. Meringue, black pudding, ales, liqueurs, smoked garlic and onions, granola, cakes, olives, oils, books and more were also in abundance, but I couldn't get to them all as much as I tried. Despite that, it was a fantastic day of eating, drinking, learning, and fun. Would I go again? Without a doubt. Would I recommend it? Definitely.